Kayak fishing has become quite the craze over the last few years due to a few understandable reasons. One reason is because it’s more affordable than the traditional form of going out and buying a boat and trailer, along with the gas that is needed. There’s also another huge difference between kayaks and boats, in a kayak you’re closer to the water which leaves you more vulnerable to currents and winds. Because of this risk, it’s extremely important that you know how to kayak before going out onto the water. Another advantage to kayaks over boats is that you’re able to reach more secluded areas of water that boats can’t access. That allows you to be able to access all those “secret” spots. This is by far the most important decision you’ll make when it comes to preparing to go kayak fishing. Fishing kayaks are built differently than just normal paddling kayaks. 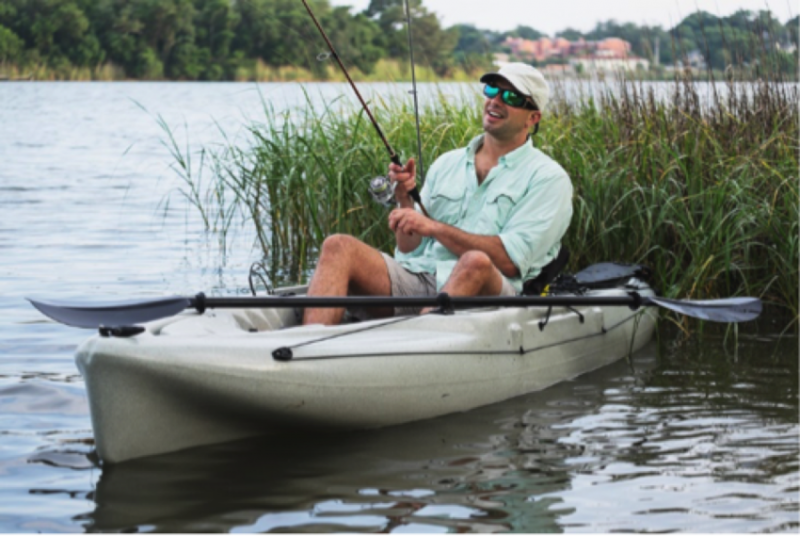 Most fishing kayaks are what is called sit-on kayaks because they give anglers more stability to stand up to cast and to reel in that massive catch. Plus, they have large storage compartments to put coolers or rod holders as well as an area for your live well. This type of kayak is also wider than your traditional racing kayak because you don’t need to worry about being aerodynamic for speed purposes. 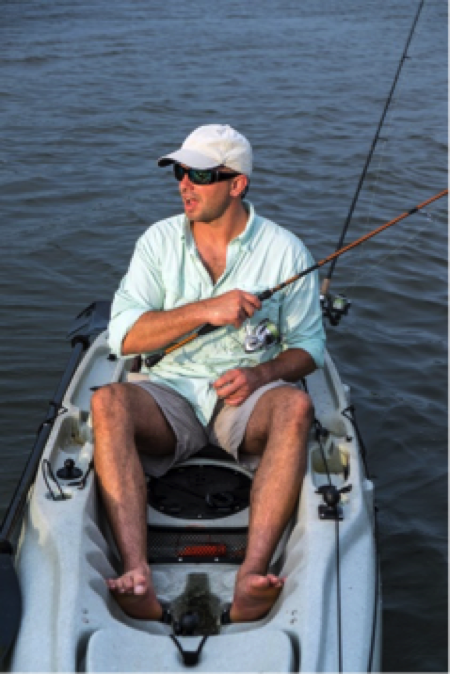 Check out choosing your kayak for an in-depth guide on different kayak category types. This is the biggest adjustment any angler used to fishing on a bank or boat must make. Two handed casts require a level of stability when making the quick movements of shifting your weight that a kayak just can’t provide. Now that’s not saying it can’t be done but it’s not the wisest or safest decision if you want to stay dry. When casting one-handed you might want to consider a lighter reel and bait if possible. Spinning tackles or baitcasting reels are the most popular choices among experienced kayak anglers. Normally paddling with two hands is what you will do but what happens with you’re reeling in the gigantic fish and it’s dragging you all over the water and you’re about to hit something? Well that’s where being able to paddle one handed comes into play. You will need to be able to steer yourself from hitting low hanging branches or obstacles in the water. To do this you will want to lock the paddle along your forearm and use the paddle similar to a canoe paddle. Your feet can be a valuable tool out on the water, I know that sounds odd, but they truly can. You can use them as leverage to steer away from obstacles or as an anchor. Simple enough you just need to stick your foot out to push off an obstacle to steer you out of the way or you need to stop then find a log sticking up in the water and put your foot on it to anchor yourself. Another way to use your legs is when you feel like you are wobbling or about to tip over. The truth is that this will likely happen to you quite often so you need to be prepared. This best way to stay dry, well half your body dry, is to straddle your kayak by putting both legs into the water, one on each side. This lowers your center of gravity and helps you regain stability. This is particularly important when on lakes and it’s windy. Staying close to the shore protects you from high winds. Being in an area where currents are strong is a bad condition to be in when fishing because your stability will be affected. So, it’s best to stay in as shallow of water as possible. Staying out of these conditions also helps when you are paddling because you won’t be using extra energy trying to paddle through a headwind or fighting rough currents to stay upstream. A lot of beginners find that using a trolling motor helps them feel more comfortable out on the water and it will help you save energy not having to paddle which will allow you to stay out longer. Trolling motors will attach to the back of your kayak and is out of the way enough that it will never interfere with any of your movements. Trolling motors give you the ability to move while reeling in the big fish and gives you the comfort knowing you don’t have to worry about handling a paddle. These are the most important techniques any beginner angler needs to know but be sure you know kayaking basics before you go out for your first fishing trip. Nothing is worse than reeling in the lake record fish and you tip over ending up in the water.